Today's recipe is for one of my most favorite side dishes.. Hummus! 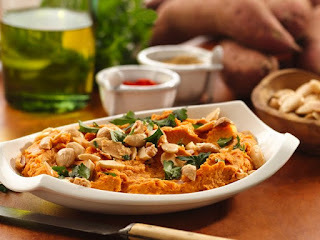 This one is a big different than regular hummus recipes as it includes some sweet potato, it adds the perfect sweetness with the chick peas. Keep reading on how to make it..
Hummus with fresh sweet potato packs even more plant power. Add a delicious blend of smoked paprika, coriander, and cumin to make this flavorful dip.